This map, illustrating the purported travels of the Venetian ship owners Nicolo and Antonio Zeno during the period 1380 to 1387, is central to "one of the most ingenious, most successful, and most enduring literary impostures which has ever gulled a confiding public." Lucas 1898, 157. It was first published in 1588, together with purported letters from the Zeno brothers describing "Estotiland" in a way that identified it unmistakably as modern Labrador, thus establishing a claim that the Venetians had discovered America more than a century before their Genoese countryman. "[T]he sixteenth century . . . embraced the Zeno brothers wholeheartedly. Ramusio and Hakluyt reprinted their descriptions, and the . . . geography of the map was reiterated by some of the best cartographers of the day. . . . The authority of the Zeno map was enhanced when it was used in the quarto editions of Ptolemy published in Venice beginning in 1561." Karrow 1993, 601; Lucas 156-57; Burden 1996, #29. 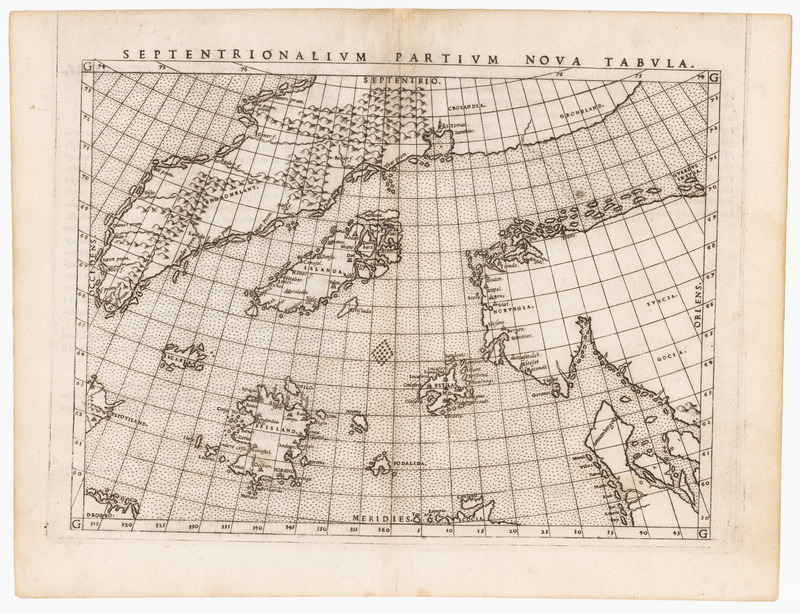 Late in the 17th century, the important two-sheet "America Settentrionale" by the distinguished Venetian cartographer Vincenzo Coronelli showed "Estotilandia, o The New Bretagne, et Tierra de Labrador, Scoperta da Antonio Zen Patrizio Veneto nel 1390 Prima che gli altri Paesi dell America fossero conosciuti" [Discovered by Antonio Zeno Patron of Venice in 1390 before the other lands of America were known]. Despite recurring doubts (Lucas 40-56), the Zeno map retained its currency for more than 300 years, until a skilled deconstruction by Frederick Lucas presented "clear evidence" that it was the product of "a contemptible literary fraud - one of the most successful and obnoxious on record." Lucas 143. The Zeno map first surfaced as the "Carta da Navegar" in "De I Commentarii," a work published by a 16th century descendant of the brothers, also named Nicolo. Burden #26. The younger Nicolo Zeno held a number of important positions in the Venetian Republic and served as a member of the Council of Ten. Karrow 600. His work consisted of reprints of 14th century letters he had purportedly discovered years earlier, together with his own commentary. Lucas demonstrated that the younger Nicolo "certainly did not compile his narrative from any [purported letters], but from the published works of Bordone, Olaus Magnus, and other authors." As for the map, Nicolo said in the Commentarii that "it occurred to me to draw out a copy of a navigating chart which I once found that I possessed among the ancient things in our house, which, although it is all rotten and many years old, I have succeeded in doing tolerably well." Lucas 8. It appears, rather, "That the story that the 'Carta da Navegar' was copied from an old map found in the archives of the Zeno family is a pure fiction; and that it was, in fact, copied from several maps, of various dates and nationalities, and not from any one map." Lucas 156. There was apparently "sufficient motive" for the younger Nicolo's deception "in a desire to connect, even indirectly, the voyages of his ancestors with a discovery of America earlier that that by Columbus, in order to gratify the compiler's family pride and his own person vanity, and to pander to that Venetian jealousy of other maritime nations (especially of the Genoese)." Ibid. The date is estimated; this map was printed from Ruscelli's Plate 1, used in editions of 1561, 1562 and 1564 and not in later editions. Burden #29. Ruscelli, Girolamo. . La Geografia di Claudio Tolomeo Alessandrino nuouamente tradotta di Greco in Italiano.